charles hugh smith-How Many Foreclosures Will Hit the Market? OK people, stay sharp. We're going to thread our way through a lot of housing statistics and reach a mind-boggling conclusion: 5 million foreclosures, 5 million investment/2nd homes dumped on the market and bank/thrift losses of $500 billion. Farfetched? Read on. First up is housing Bull Michael Youngblood, managing director of asset-backed securities (a.k.a. mortgage-backed securities) at Friedman, Billings Ramsey who states in this week's Barron's: "What dominates the mortgage market is income." In other words, if people have jobs, housing will continue to rise. He goes on to assert that interest-only loans are not more dangerous than fixed-rate mortgages. Leaving aside that Mr. Youngblood earns his living selling "securitized" mortgages (if people stop paying the mortgage, the value of the security plummets--not that you'd hear that from Mr. Youngblood), let's look at his thesis. 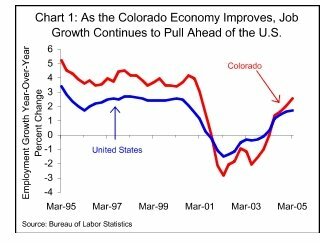 The chart above shows job growth in Colorado to be better than in the nation as a whole (unemployment is a low 4.7% nationally). 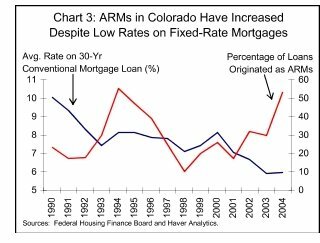 Next, look at the chart of Colorado adjustable-rate mortgages (ARMs). Even as fixed-rate mortgage rates dropped to historic lows, over 50% of the loans in Colorado were ARMs. Colorado’s foreclosure rate leapfrogged to highest among the states thanks to a 31 percent increase in new foreclosures from the previous month. The state reported 5,392 properties entering some stage of foreclosure in March, a foreclosure rate of one new foreclosure for every 339 households — more than three times the national average. Fully 27.1 percent of Boston's homeowners with a mortgage spent at least half their gross income on housing in 2004, according to the latest census figures available. Those costs, which include utilities and insurance as well as mortgage payments, were more than double the national rate of 11.7 percent and topped New York (25.9 percent), Los Angeles (26.5), San Francisco (20.4), and Chicago (20.3). Of the 25 biggest cities, only Miami had a higher rate (35.8 percent). The number of homes sold in Massachusetts dropped a whopping 21 percent in January compared with a year ago, the largest year-to-year decrease in monthly home sales in a decade. As a result, home values have begun to soften. Such pressures are forcing a rising number of homeowners to erase their debts by forfeiting their homes. Foreclosure filings in the county that includes Boston nearly doubled in January from a year ago, ForeclosuresMass says. When 30-year, fixed-rate mortgages were standard, a rise in interest rates would have little effect on current homeowners. But in an era of adjustable-rate loans, it can exact a toll which is especially difficult for minorities, housing experts say, because they are most likely to hold higher-cost subprime loans. When they refinanced their home two years ago to pay off some bills, Robert, now 78, was working as a deliveryman. But his employer went out of business last April. Now he and Lorraine, 72, a retired nurse, are both seeking work. The rate on their mortgage has jumped from 7% to 10.5%. Now, the real estate market is cooling, interest rates are rising and tens of thousands more Americans are starting to have trouble paying their mortgages. Nearly 25% of mortgages — 10 million — carry adjustable interest rates. And most of them went to people with subpar credit ratings who accepted higher interest rates, according to the Mortgage Bankers Association. Already, in West Virginia, Alabama, Michigan, Missouri and Tennessee, about one in five homeowners with a high-interest (subprime) ARM was at least 30 days late at the end of last year, according to the Mortgage Bankers Association. After 90 days, the foreclosure clock starts ticking. These adjustable-rate loans were concentrated in the hottest markets, such as California, where about 60% of all loans last year were interest-only or payment-option ARMs. That's the highest such rate in the country. Of the 7.7 million households who took out ARMs over the past two years to buy or refinance, up to 1 million could lose their homes through foreclosure over the next five years because they won't be able to afford their mortgage payments, and their homes will be worth less than they owe, according to Cagan's research. The losses to the banking industry, he estimates, will exceed $100 billion. That's less than the damage from the savings-and-loan crisis in the 1990s, which cost the country $150 billion. The Browns in Missouri have had a happy ending. The lender, Saxon Mortgage Services in Texas, declined to discuss the Browns' case with USA TODAY last week. But within 24 hours of a call from a reporter, Saxon agreed to give the couple a fixed-rate loan at 7%. Hmm, nothing like a little media snooping to pry a fixed-rate mortgage out of the woodwork, eh? This tale reveals how subprime lenders have taken advantage of desperate/ hopeful/ignorant homeowners who are stunned to find their rates rising 3.5% in one bound. 27.7 percent of all homes purchased in 2005 were for investment and another 12.2 percent were vacation homes. All together, there were 3.34 million second-home sales in 2005, up 16.0 percent from an upwardly revised total of 2.88 million in 2004. The market share of second homes rose from 36.0 percent of transactions in 2004 to 39.9 percent in 2005. As the market softens, investors are finding that they can't dump their units for love nor money. Here is a Washington Post story investors hurting; Doors Close for Real Estate Speculators After Pushing Up Prices, Investors Are Left Holding Too Many Homes. millions of recent buyers are spending more than 50% of their income on housing, leaving them extraordinarily vulnerable to job losses and ARM resets. Some 10 million properties have been purchased in the past 3 years as investments (or if you prefer fig leafs, as "second homes"). Many of these investors are vulnerable to the same ARM resets and job losses subprime borrowers face. In a nutshell: in the past 3 years, 10 million people signed ARM mortgages which will reset soon, and 10 million housing units were sold to investors. Foreclosures are already rising, even though job growth is strong and unemployment is low. In addition, 4 million recent homebuyers are subprime risks whose grasp on their homes is tenuous indeed. If 5 million marginal bubble-buyers fold their hands due to ARM resets or job loss, what will that do to the value of those 10 million investment units? Let's say the resulting drop in values causes half of those empty, cash-flow negative units to get dumped on the market (or foreclosed upon). Who's going to buy these 10 million properties? One last chart. Bank reserves--the cash lenders keep to cover "bad loans"--is at an all-time low. 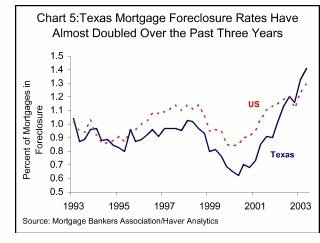 That leaves lenders extraordinarily vulnerable to losses should foreclosures rise. The expert quoted above estimated bank and thrift losses of $100 billion should 1 million homes go into foreclosure, so what happens if 5 million properties default? Simple extrapolation suggests losses would exceed $500 billion. Does that sound extreme? Not at all, when you consider that the dot-com bubble bursting erased at least $1 trillion in equity. Compared to that, a mere half-trillion in losses doesn't seem unrealistic.